Gold framed, with quote "Peace unto this house and all who dwell within it. Peace unto all who enter and all who depart." 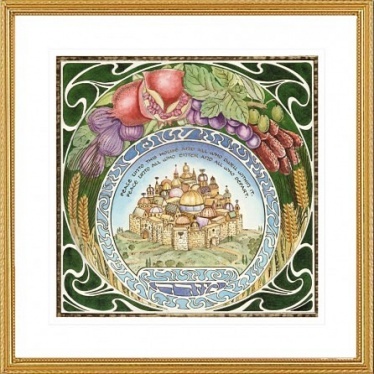 A portrayal of Jerusalem is surrounded by the biblical seven species of fruit of the Land of Israel: wheat, barley, grapes, olives, figs, dates & pomegranates. A Mizrach is traditionally hung on the eastern wall of a home or synagogue. Option to personalize with a plaque. $25 Please write out names, dates, and a brief message if desired, in Inscription box, when ordering.